A small notebook is a good thing, especially when one has to work and travel a lot. In long trips when you have to take a computer with you, every gram seems very pressing. On the other hand, it often happens that a small size goes along with crippled functionality... but if we need a good set of features we will buy a big notebook PC, don't we? Let's see what the Prestigio Visconte 121V can offer us. The system is based on the VIA C3 processor. Later we will see how efficient it is. 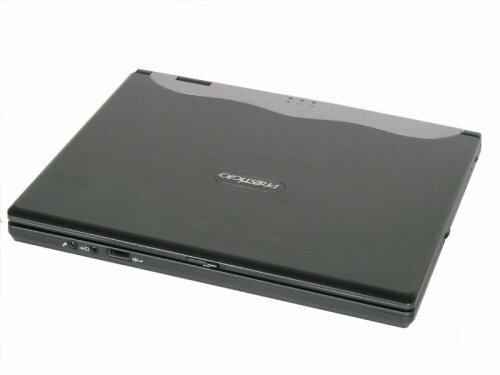 One of the original features of this model is a Compact Flash slot, and the notebook can be thus paired with a digital camera (because most of them use exactly this memory card standard). It's noteworthy that the specs given at the site do not mention the FireWire (I-link) though it's physically integrated. It's very important because you can connect ordinary consumer cameras that support this standard. 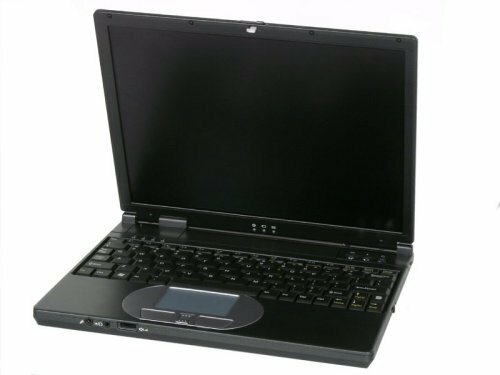 Also note that this model has a record weight for this type of notebook PCs. The mic-in, audio-out (combined with S/PDIF) and volume control are in front. On the left (left to right): Kensington lock, modem and LAN port, CompactFlash slot (with a cover), air vent (sometimes working as a hair drier). 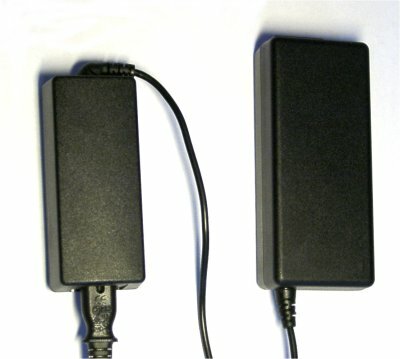 On the back (left to right): LAN port, USB 2.0 port with a protection cover, and battery. In the right-hand corner is a monitor-out covered with a rubber cap. The right panel houses an air vent, a 4-pin i-Link (FireWire) port covered with a cap, a PC-card connector with a cap and one more USB 2.0 port also covered with a cap. I must say that the layout of the connectors is very convenient for such a small system. The notebook comes with the preinstalled Windows XP Eng. and without any external devices. That is why some benchmarks including Sysmark 2002 and Mobilemark 2002 failed: both ended up with an error in the scripts (ZDbench had a great spread in values). These tests should be carried out under the specially installed English version of the Windows, but even in that case it's not evident that the tests won't fail. That is why errors in these benchmarks are not extraordinary. Besides, the scandal around the 3Dmark2003 related with optimizations and cheats in benchmarks added fuel to the fire. I.e. it's unclear how scores are calculated and whether they are adequate to a real situation. That is why beside the test packets, I also put notebook PCs into real situations. At the moment I use two types of such tests - reading (reading or editing of one file in the Word, or plus one more application at most), and DivX playback from CD (this is the heaviest mode of the notebook's normal operation, except games). It the first case it worked for 2 hrs. 40 min. and in the second case about 1 hr. 13 min. (the details are given below). In the 3Dmark2001 the S3 Twister integrated graphics showed us very beautiful and clear pictures (I've never seen such before), but the speed was only 1 frame per sec. Let's start with a keyboard as the most important part for me. First, the notebook is small, and a full-sized keyboard can't be cramped into it; secondly, we tested a preproduction sample, which also should be taken into account. Some keys on the keyboard were made smaller than usual, but this is rather a cost of the size than a disadvantage. The developers managed to left the original size of all letter keys except the right lower corner: since 4 keys are made smaller I often accidentally pressed "shift" instead of "/ ?". The keys in the lower row - cursor, tab - are also small, but once you get used to them, you have no problems. The ins/del keys are in good positions but they are so small that it's difficult to hit them. The tactile sensation is more or less good - obviously, the keystroke is not great, but the keyboard is not tough. 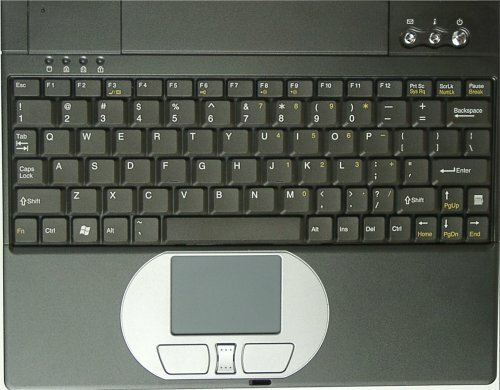 By the way, the right part of the keyboard was lifted by about 3 mm, but I think that it's because this is a preproduction sample (the company says that the lot meant for sales is deprived of this problem) - it turned out that they keyboard in this particular notebook is wrongly placed. It often happens to preproduction samples. The touchpad buttons are a bit tough but not that uncomfortable. 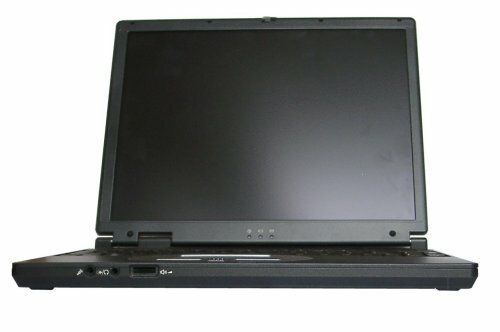 The touchpad performs like in most other notebooks - with the standard Windows drivers it's too slow, but once you adjust its speed, no more problems arise. The notebook has a plastic case. The bottom section is pretty rigid, only the right part of the palm rest is more flexible). The battery sits very tightly. If you press well on the display lid the matrix will be a little distorted, but in general, the design doesn't look fragile. All the components fit well together, no slits are noticed. I like the way the main LEDs are positioned - they are in the cover, under the matrix, and can be seen from inside and outside. You can thus monitor the notebook's status with the cover open and closed. One more noteworthy fact. Since it's supposed that the notebook will be taken to various places, all connectors are covered with caps, plastic or rubber, except the modem and LAN ports. This model looks beautiful with the open and closed display lid. 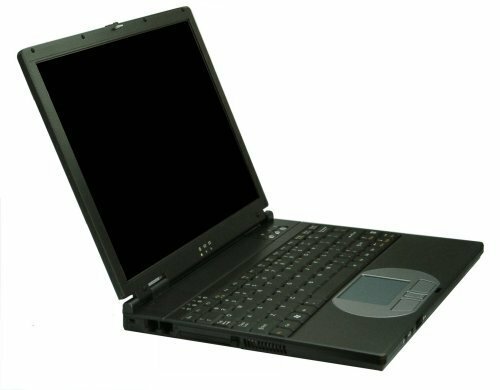 When the notebook is folded up, its roundish corners make it more charming, when it's open, the touchpad's framing looks catching indeed. However, I think that the display's cover looks a bit cheap with such color, - I wish it were pitch-black. But the overall appearance is really attractive. By the way, the power supply unit is also smaller and lighter than an average one. Above you can see it compared with a Delta's unit which comes with most South Asian notebook PCs. It's very good of the manufacturer to take care of such a petty thing. I'm really glad to see the tendency to put the battery behind! It makes the notebook makers unable to put all connectors behind. Here the connectors are arranged ideally - on the back you can see only those ports which are rarely used or if their positioning on the side panels is inconvenient. Those connectors which are usually often used are located on the left or right. The matrix in the Prestigio Visconte 121V doesn't differ much from those of the other tested models, regarding the viewing angles and pixel response. Only the horizontal viewing angles are a bit smaller - the dark colors turn negative at around 50 degrees. The same figures refer to the vertical angles, but it's typical of most matrices. However, at the right angle the matrix looks bright and contrast. As to the resolution, the standard one of 1024x768 was enough for me when it worked with the PC on my lap. If you put it on the desk, it can be a little difficult to read the text. But I used it only on my lap or on the desktop close to my eyes, and in this case 12.1" is enough. However, I couldn't work without my glasses. The audio subsystem is generic. The speakers are average, but since the case is so small, the speakers are placed behind underneath. That is why the sound is pretty deaf, and details get lost. Usually, small systems can't demonstrate a record time of running from battery. The only hope was pinned to the VIA's processor, maybe it could demonstrate low power consumption. Maybe it really works more efficient than its competitors, but its big brothers show the same figures: in the Word and Paintshop (analog of the Photoshop) it worked just a bit over two and a half hours (the maximum time in reading tasks hovered about 2 hrs 40 min), and in the DivX playback mode it was one hour and ten minutes. Probably, the manufacturer will release a more capacious battery for this model (with one more row of elements jutting out of the PC case), and the run-down time will grow up. This model doesn't differ much from its siblings in these parameters as well (except those which are based on the Intel Centrino technology). But I don't know whether it should be considered a weak point. On the one hand, the VIA C3 lets us hope that the temperatures won't be too high; on the other hand, the case is small, and it's not easy to arrange a ventilation system here and a big heatsink. That is why such temperatures can be considered acceptable. After the heavy load (DivX playback) the bottom is unpleasantly hot. In usual conditions it is warm. In office applications the noise level is pretty low - it just buzzes a little. And under the heavy load the fan switches to its full capacity and starts wailing, and the air vent blows out a trick flow of hot air. None of computers can be ideal. 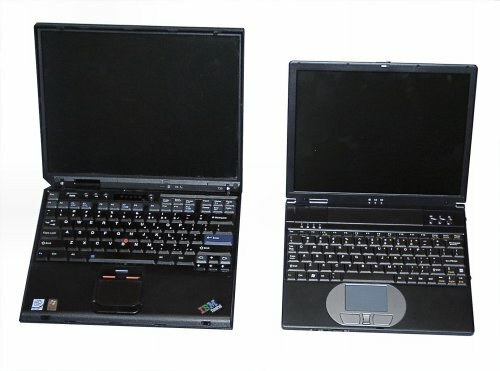 I understood that when I worked yet on the IBM T30 (it had more petty loopholes than others), that is why I don't judge other notebook PCs too strictly. Nevertheless, our readers should know certain facts about it. The battery charge alarm system is too annoying: starting from about 10% of the battery capacity (when the power supply LED changes from green to yellow) the computer starts squeaking every thirty seconds. And I couldn't find how I could turn it off. Why is it important? Once I turned out to be at the conference when the charge level reached 10% and I had to turn off it though the battery could last at least 20 minutes more. By the way, the RoverBook Nautilus 570 has the same problem. The fan behaves "nervously" under the heavy load, - from time to time it spins up and then immediately spins down. First it looks funny but then it irritates. Probably, the monitoring reacts to changes in the CPU load too sharply. Another problem is that the notebook couldn't play the test DivX disc at the high-quality level. Frames often fell out. However, at Comtek I noticed the same behavior of the Eden platform and C3 processors, that is why this is probably an overall problem of VIA processors. The Windows media player demonstrated better results, but it obviously set lower quality. Well, this model isn't a match for playing highly compressed movies. Such notebook will be a good companion in frequent trips where the aspect of weight becomes vital. Also it will be a good choice if you don't like to take a lot of things with you and a computer is needed for a narrow range of simple tasks. This model should be regarded as a computer for word processing and other business applications (the market sector it is positioned in), and for immediate looking through photos made with a digital camera (probably, with on-the-fly editing) or for connection of other peripherals (USB 2.0 and FireWire). For this type of tasks this notebook is irreplaceable. I didn't notice quality degradation when working in the Paintshop, the colors were acceptable. That is why it can be a good purchase for photographers as they can take it with them and estimate shots on the spot. By the way, instead of the cable connection they can directly use the card reader. Does this model have a future? It much depends on the price. Its weight/size parameters are excellent - a notebook which can be put into an overstuffed bag can't be a bad thing. But I don't think it can replace a main computer. It's rather a good add-on for a high-performance workstation. And here the main problem is that the market offers similar models based on the Intel Pentium 3 ULV. And this notebook can't offer any new features. That is why we hope the price policy will be correct. This notebook doesn't hold records. But it's a good computer for the tasks it was planned for. Also, it has a pretty nice look especially when it's unfolded. But the prospects will much depend on its price. If its price is acceptable as compared to the competitive Prestigio Visconte 121V, it will be able to take its niche on the market.